UPDATE: I forgot to mention that this cartoon appears to feature the same bear family that is ruthlessly abused a year later in the previously mentioned cartoon The Three Bears. 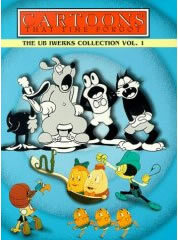 This cartoon, along with almost all of Ub Iwerks cartoons for his own studio, are available on the excellent DVDs The Cartoons that time Forgot Volume One and Volume Two. Jack Frost is on Volume 2.